For over two years, paleontologists have been chipping away at Dakota, a typical mummified duck-billed dinosaur that remains encased in a "stone tomb". The Dinosaur, however, is almost 75 percent removed, revealing what appears to be fossilized skin, ligaments, tendons and, scientists hope, some fossilized internal organs. 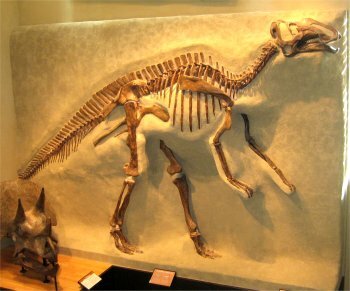 Dakota is an Edmontosaurus that lived 65 million years before in what are now the North Dakota Badlands. So far, 1,000 pounds of rock have been eradicated from the dinosaur by scientists who are using tools that look like dental instruments. Dakota along with its tomb weighed more than 4 tons prior to the chiseling project began. The workers also utilize small, air-powered jackhammers, which fill the room with buzzing sound. Amy Sakariassen, an archaeologist who works on the dinosaur part-time, said she is pleased if she can even successfully remove a coin-sized section of rock each day.